Recently, Gaza Strip ( Gaza Strip) in Palestine ( Palestine) erupt between militias and Israel (Israel) bloody conflict has made the future of the Gaza Strip indefinitely. Significantly, there was heavy firing during a Israeli army campaign against Hamas. The firing was confirmed by the death of 7 people, including an Israeli soldier as well as a local commander of Hamas’s armed wing. Hamas, who controlled the area, started resisting hundreds of missiles and shells on Israel in retaliation, in response to which Israel also carried hundreds of air and ground assaults. Israel demolished Hamas military intelligence headquarters as well as television and radio stations. 1.82 million people deprived of resources, this was the most horrific Israeli attack after the 2014 war. Within a decade, Gaza is facing a fourth war. This area has been devastated for years. In the last wars, Israel carried out heavy attacks on the public places of Gaza Strip, resulting in the death of a large number of people, in response to this attack, Hamas had attacked missiles in the civilian areas of Israel. Israel has blocked the water, land and property in this area so that Hamas can not be prevented from mobilizing arms and reducing its influence on the Gaza Strip area. But Hamas is still capable of maintaining control over Gaza and is collecting arms in different ways. The common citizens have to face the most problems due to blockade. The unemployment rate in the area is approximately 40 percent. Administration has no control over imports and exports. The Gaza Strip has to face countless problems like diesel, heavy deficiency of gasoline, power cuts, stagnant sewer plants. 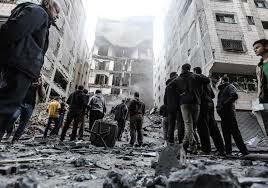 In fact, Israel has given a collective punishment to the Gaza Strip. Hamas is the most prominent Islamic extremist organization in the Palestinian territories. It was formed during the public movement of 1987. Since then, it is struggling to remove Israeli forces from the Palestinian territories. Hamas does not recognize Israel and its goal is to establish Islamic nation in the entire Palestinian territories. Hamas is very popular in the Gaza Strip, where poverty is higher than the western edge. Hamas’s most influential spiritual leader Sheikh Ahmed Yasin is considered a generous face of the Palestinian Islamic movement. Paralyzed Sheikh Ahmed Yasin was released from Israeli jail in 1997. After the release, Sheikh Yasin took all his attention to improve the condition of Islamic welfare institutions which had been devastated in Israeli attacks. This organization, run by Sheikh Ahmed Yasin, has two political and armed units. The political unit of the leader Sheikh Yasin has so far built hospitals and schools in the western coast and the Gaza Strip. This unit also helps in social and religious matters of local people. Hamas’s armed unit attacks Israeli bases. Hamas has done several suicide attacks in Israeli areas. The situation has worsened in recent months. Immediately after the formation of Israel, about 7,50,000 Palestinians were ousted from their homes in the first Arab-Israeli war in 1948. Recently thousands of Palestinians started marching on the border demanding their return to their native land and land. This march has been continuous, in response to which bullets have been often run by Israeli soldiers. About 200 Palestinians were killed by the Israeli soldiers and thousands were injured. Recently, Egypt and Qatar offered mediations in negotiations and provided necessary resources in Palestine’s interior areas. Israel gave a positive response in this context, which would also provide oil tank and financial support in Gaza. It also established a forum for further negotiation, but in Israel’s undercover mission in the interior, the current crisis started. Underscoring the dangerous situation, the ceasefire was announced by both sides. But violence continued on the border. Israel and Hamas should stop themselves, while allowing for human intervention proposed by Egypt. Gaza does not need any war, no support for the moment.